We wouldn’t be offended if some of you thought we had met some sort of end as we’ve been non-existent on our online spaces for over a year now but we feel like we have a valid excuse this time!! Since late 2017 we’ve been focused on a whole new chapter in our personal lives, our greatest adventure yet. His name is Jasper Stearns and he was born on June 7th last year. We think he is the most awesome person this universe has ever seen (#totallybiased) and we’ve been consumed in enjoying every moment of time with him since he joined the air-breathing segment of humanity. It’s left us, however, with far less time to focus on our business. But 2019 is a new year and we’re committed to getting back to work with and for all of you! Have no fear, our cameras and our printers have decidedly NOT grown dusty. Jasper might possibly be the most well-documented baby of all time! We also did manage to squeeze in a photo shoot each month of the last year for our partners at Newton Neighbors Magazine and Best Version Media, shooting portraits for their monthly covers. There is more to share about that in an upcoming post. So for now – we’re here, we’re alive and full of joy! Not just that but we are ready and eager to share in your lives and your joys and make records of them that will be meaningful for the generations to come! So drop us a line! We’ve been missing you! In honor of Earth Day, here's a quick little video of some of the reasons why we love our planet and why we have committed this year to teaming up with 1% for the Planet to be sure we do our part to give back to the this place of infinite beauty - this place we all depend on for life. There are many things Andrew and I have been honored to be able to photograph, but chief among them for me is the Jimmy Fund Clinic's annual retreat for teenage girls. The bonds formed are immediate and palpable; it is truly so meaningful to behold and an honor to be able to document for them! This year's event was no exception. Treated to a shopping spree, dinner on the town and a show, makeovers and manicures - these beautiful young women get to relax and enjoy each other's company and I just love it! Andrew and I are honored to have been chosen as the photographic partners this year for Best Version Media's most recent publication, Newton Neighbors. February saw the release of the first printed edition to a large segment of the Newton residential population. We will work with one new local family each month to produce a photo for the front cover and then more about them is shared in a feature story inside the publication. In it's mission to help deepen community ties, the Newton Neighbors publication is modeled after it's successful sister publication that is distributed in Natick. So far, we've been really impressed with the philosophy, the content, and the production team we collaborate with! 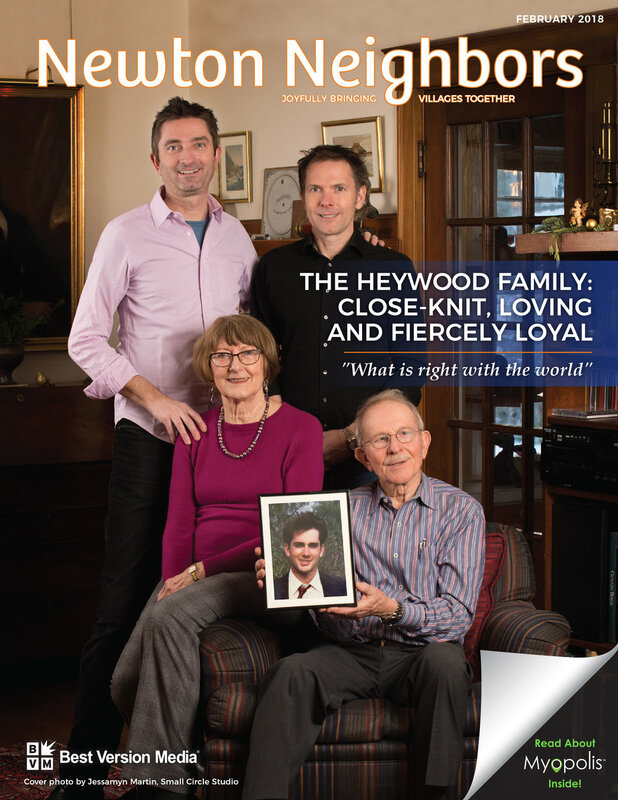 On New Year's eve we shot the first featured family, the Heywoods, who were a delight to meet and get to work with. More or less right out of college in 2004, the first real job I held was at Newtonville Camera. I started there somewhere around the fall or early winter of that year, working at their Front Counter under the tutelage of some pretty awesome people. As a life-long customer of the store, I was thrilled to enter the work force employed somewhere that felt familiar…and for an opportunity to grow my passion for photography to boot! That said, I had no idea how much more would come from having this job. All these years later, the time became ripe for reflection this past weekend as the family-owned business closed their doors at 249 Walnut Street to prepare for their move just a mile or so away into a great new space in the neighboring city of Waltham. Andrew and I decided to pay a visit to our old stomping grounds and take one last look around the store where we both spent so many years. Memories of the vibrant community of photography enthusiasts came flooding back – a home away from home that fortuitously also served as our introduction to each other more than a decade ago! More valuable than the vast amount of knowledge I acquired from my colleagues and customers during my tenure at Newtonville Camera, are the personal connections to the wonderful people I discovered there. Walking around the store this past Saturday, I encountered old customers whose friendships from that time I still count as blessings today – like the photo teacher from Bedford High School, Larry, and the now well-established Boston events shooter, Michael Blanchard, whose career path from student to working professional I witnessed from behind the counter; treasures each and every one of them! 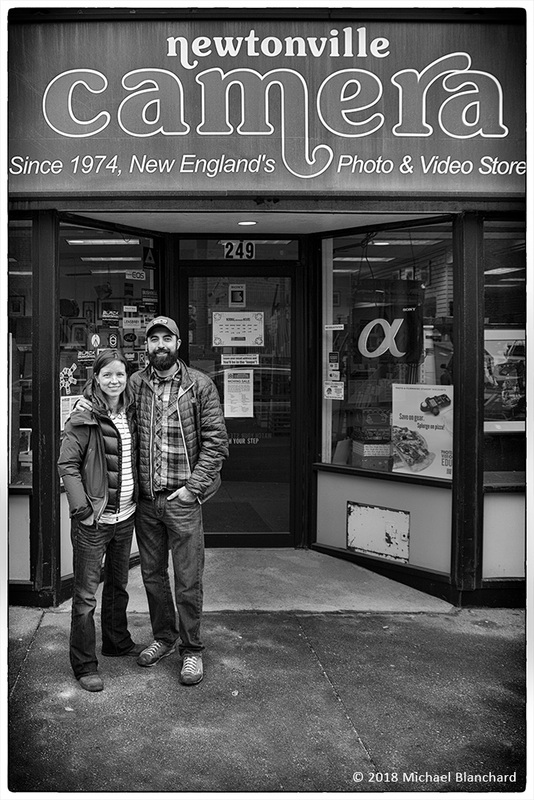 Although it’s hardly a time to be sad, as the Newtonville Camera service and community will continue in their new and improved location on River Street in Waltham, the nostalgia was great for me that day. Maybe it’s the surge of pregnancy hormones (as Andrew and I have been developing a little something of our own), but when I think of all of the things in my life that I treasure most, so many of them came through this store – my friendships, my marriage, my profession, my community. So to that camera shop on the corner of Walnut and Washington in Newton, my heart truly carries so much gratitude. To read more about the store and its upcoming transition to Waltham, read this great article by fellow photographer and all-around amazing person, Rachael Cerrotti: https://www.rewire.org/work/newtonville-camera/ There will be soft reopening in Waltham in early March, followed by a grand reopening on April 2nd. Join them and be a part of this amazing community! Small Circle Studio is now a proud member of 1% for the Planet. We take responsibility for the health of our planet by donating 1% of annual sales to environmental nonprofits creating positive change. Learn more at onepercentfortheplanet.org and join us! A mother's role is supreme in the shaping of us all. Long after we are grown, even, and long after they are gone, still - they inform who we are in ways even we can't sometimes fully understand and appreciate. For all they do - the big things and the little things - they deserve our unconditional respect, not just today but every day! Happy Mothers Day to all the beautiful and strong women out there who have shaped life! There is a wonderful local artist with a studio right in our own neighborhood, who Jessamyn has had the privilege of working with for nearly a decade now. Every year we get together and update the record with all his artwork from the previous year. He uses the digital files we deliver to share with curators and interested collectors. His work is impressive ... intriguing and a bit mysterious - which makes us love photographing it even more. We can enjoy it and study it further as the files are processed into replicas of their originals, clean digital documents of the time, talent and vision he lends to all his artwork! We had a great time yesterday working with an extremely talented artist with studios in the Boston and San Francisco areas. As she prepares for an upcoming rolling exhibition which will feature some of her stunning oil paintings along with artwork from a few other artists, she requested updated portraits to use in the press kit for these shows. We had a wonderful time working with her in a variety of different spaces within her studio and her home!